Jesse Pinkman is a high school drop-out, part-time meth user and small-time meth manufacturer and dealer on AMC’s Breaking Bad. He operates under the code name Cap’n Cook when he is unintentionally reunited with his former chemistry, teacher - Walter White. ​The two team up and become the “Dynamic Duo” of the Albuquerque drug trade. If there is anything more noticeable than Jesse and Walt’s “chemistry” it’s Jesse’s fashion sense. Jesse’s signature look usually starts at the top of his head with one of many beanie hats. He is seen wearing a few different ones regularly during the course of the show including: black and red, yellow and gray striped and black and red striped just to name a few. ​This black and red beanie hat is a perfect match to the one Jesse wears early on in season one of Breaking Bad. Jesse Pinkman has a vast array of different jackets, most of which are zip up hoodies. The most recognizable jacket that Jesse wears has to be his plain yellow zip-up hoodie, followed closely by a red or black graphic hoodie. ​He is also noted for wearing other even flashier hoodies with loud patterns and bright color schemes. ​After the untimely death of his girlfriend, Jesse seems to take a more reserved approach when it comes to his style and wardrobe. Displaying a more subtle taste with jackets such as a simple black number or an ivory colored cardigan sweater. This yellow hoodie by American Apparel is nearly identical to the one worn by Jesse Pinkman. ​Here is an ivory cardigan that is also a very close match to the one seen on AMC’s Breaking Bad. Jesse has almost as extensive a collection of t-shirts as he does hoodies… almost. Jesse’s t-shirt collection has been noted to include such brands as Volcom, Metal Mulisha, Archaic and even a DJ Aoki tee. ​Sometimes however, Jesse is also known to wear a simple plain colored tee with no graphics or markings of any kind, usually red or gray. 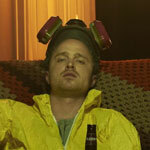 ​If you are looking to put together an accurate Jesse Pinkman costume you’re going to need a t-shirt. This red shirt by Metal Mulisha is a very close match to the one Jesse is seen wearing in the lab when Gus takes a boxcutter to Victor. ​This simple gray shirt is a great match to the one Jesse is seen wearing multiple times throughout the series. Jesse’s jeans are so baggy, saying that they are “relaxed fit” isn’t descriptive enough. Jesse’s jeans should be labeled “retired fit.” I mean maybe he lost a lot of weight prior to his introduction and just hasn’t had time to pick up new jeans. Whatever the reason in the earlier seasons of Breaking Bad Jesse’s jeans are baggy and saggy. ​As I mentioned earlier, after Jane’s death he takes a more serious approach to his wardrobe and wears pretty basic straight leg jeans that are much more practical. ​These jeans are a very close match to the ones Jesse wears near the beginning of the series. These raw denim jeans match Jesse’s more practical style exactly. Jesse’s shoes were probably the most difficult part of writing this article, particularly because I have been unable to confirm any solid leads as to what brands or even style of shoes Jesse wore in particular. ​That being said there are two basic styles of shoe I have seen him wear, so I have done my best to find the closest matches possible for your convenience. In order to complete a Jesse Pinkman cosplay that is absolutely superior, you can accent it with one or more of Jesse’s accessories. ​This respirator by 3M is a great match to respirators worn by Jesse, Walt and a few others on Breaking Bad. This yellow jumpsuit paired with the respirator mentioned above would make for a formidable Walter White or Jesse Pinkman costume all on their own. ​No Jesse Pinkman outfit would be complete without a little bit of that sweet blue stuff, Walt and Jesse’s Blue “product”. This blue raspberry rock candy makes for a sensible alternative.